That would appear to be that for the Altima. I am, miraculously, battered and bruised but okay. Nothing broken, no serious damage. Friday night, after driving Amy home after a sushi dinner and a shopping trip to Bed, Bath and Beyond, I decided to head over to Lowe's to pick up a vent-shunt of some type for the air-conditioning register over our bed. As I was driving on County Route 12 toward Route 119, I saw a police car coming toward me, but slewing in the light rain. He swung to his right, off the road, then his left, into my lane. We were each going about forty-five miles an hour, and brakes on the wet asphalt seemed to do little good, so the aggregate speed when we hit was nearly ninety. 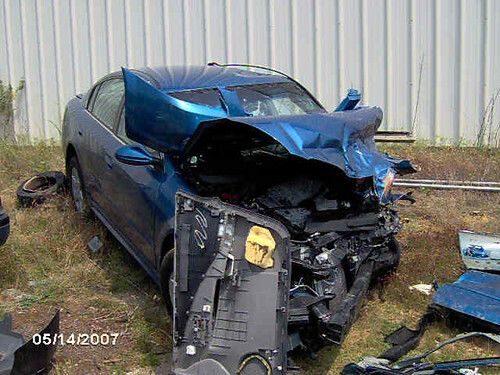 The Altima gave its life, violently, to save mine. After coming to a stop, I inventoried all my body parts, found that everything still worked, resolved to move as little as possible until I was checked out, and proceeded to call Amy, though I was still hyperventilating mildly. The "key in ignition" four-beep pattern sounded, over and over. Around the airbag I could see that smoke and/or steam was wafting from the region of the engine. While I was on the phone with Amy, the officer who'd cut me off, staggering a bit, came over to my car. 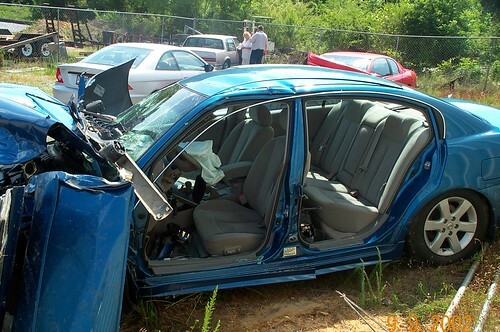 I waved an "I'm OK" arm out the window, NASCAR-style, not realizing until later that I hadn't had to roll it down. "Yeah, I'm here and I can move okay." "Okay, I've called an ambulance. They'll be here before too long." I returned to my cell phone. Amy was immobile--her car was still at her old apartment, since we were going to reclaim it the next day (we'd planned to collect her cats and introduce them to my dogs), so she called her brother-in-law Greg, and said she'd meet me at the nearby hospital where we'd agreed I'd go. As I waited for the ambulance, another police car arrived and the new officer started asking me questions about my identification, a little belligerently, but as I explained that I had not been drinking, that this was my car, that I was a responsible citizen, employed here in Birmingham, and that I was in general not some random lowlife, he became a little more sympathetic to my position. In his line of work (I believe he was an Alabama state trooper) I'm sure he has to deal with a lot of shirkers and lowlifes, so I could understand a bit of his attitude, but I thought it was remarkable that he was being so gruff toward a guy who was possibly badly hurt, and going to need cutting out of his car. Speaking of which, we had found by then that my driver's-side door wouldn't open. 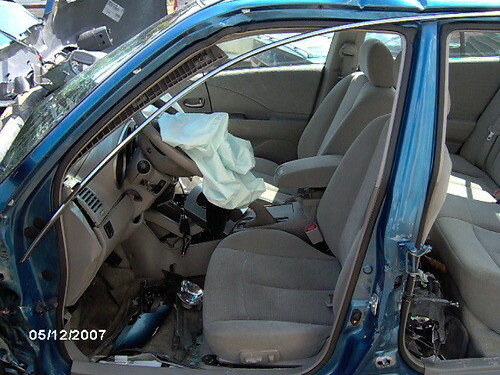 Nobody wanted to take the risk of moving me over the console in the middle of my front seat, so they began cutting the driver's-side door from the car's frame. A paramedic leaned into the passenger side, and covered me with a blanket as the guys pried and sawed at my door, to shield me from any glass or other debris that might have been flung at me as they worked. The phrase "negative LOC" was tossed around a few times, which I discovered meant that I hadn't lost consciousness during impact, as I'd mentioned to them earlier. Everyone agreed that "negative LOC" was a desirable thing. The paramedic in the car with me was a good-natured type, and chatted with me as the door-cutters did their thing: recently married; yes, Jamaica was awesome; to which hospital I wanted to be taken; how he liked the GPS he had, and that he'd be careful to pull mine out of the car so as to keep it safe (we've still got it, but it turned out not to have survived the impact). Eventually after much crunching, popping and grunting the door came off the car. "All right, Mr. Miller, we're going to take you out of the car now. Do you hurt anywhere?" I told them that the left side of my neck felt strained, and that I felt like I'd been punched in the chest. I also left like glass from the window might have worked its way into the left side of my pants' waistband, as I had a number of small, sharp pains there. 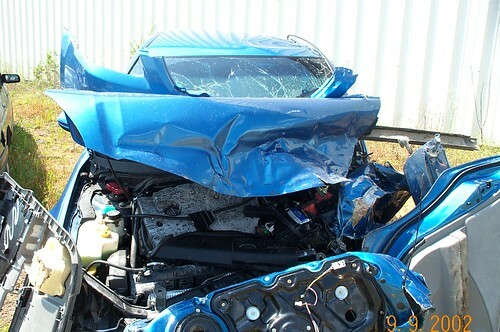 Eventually these injuries would all be shown to have come from the lap belt, shoulder belt and air bag. They put a neck collar on me, and smoothly worked me out of the car and onto a gurney. There was some brief debate about to which hospital I wanted to be taken, as the one closest to me (for which I'd expressed a preference) didn't have certain types of equipment, and for head-ons (I'd been in a head-on!) they typically liked to hedge their bets a bit more and take people farther into Birmingham. I insisted on my first choice, mainly because I was pretty sure there wasn't anything too exotic wrong with me; I did mention, though, that I would defer to their expertise if they thought I seriously needed a longer drive. At that point I was rolled into the back of the ambulance, and driven to the hospital (my first choice, as it happened). It was my first (and hopefully last) ride in an ambulance, and while the experience was actually pretty nifty, the circumstances could have been better. In order to check me out, they wound up cutting my shirt and pants off, and after that I was pretty shivery (not from shock, thankfully, but it had been an exciting evening, and the back of the ambulance was chilly). Once I got to the hospital they took me to one of their trauma rooms, and after a series of palpations and checking-overs (and another description of the events of the collision, and taking-down of my information) I was told that I'd be getting a head-to-pelvis CAT scan in lieu of any X-rays. I was also given an IV, both because it's evidently standard operating procedure, and because I was eventually going to need some "contrasting agent" injected for one of the CAT scans. Let the record show that despite having given blood to the Red Cross several times, I'm not a fan of IVs. At about this point Amy and Greg arrived, and we had some very welcome chat and additional goings-over of the events of the crash. I have to give Amy credit--I'm sure I looked like absolute hell, and she was steady and together through the whole thing. Eventually the orderlies whisked me off for my CAT scans, which took the better part of 45 minutes, and then back to my little trauma room to await the results. To make a long story a little shorter, I was cleared of any serious trauma, and released. Amy and Greg had bought me new clothes to wear home, but it took a little doing and ginger handling to help me limp out of the place and get into Greg's SUV. Since then, Amy's been a superb and patient nurse, and I've been recovering both faster and slower than I expected. Lots of stiffness, LOTS of very spectacular bruising, but you don't get to see pictures of that, because it's all in areas where my lap and shoulder belts hit me, and this is a family-friendly blog. Finally, there have been two doctor's visits so far for precaution's sake, and an orthopedic visit scheduled for tomorrow to check on some persistent grief with my right shoulder (did I mention that I tensed against the steering wheel when I saw the hit coming?). Fundamentally, though, I am whole and only lightly hurt. 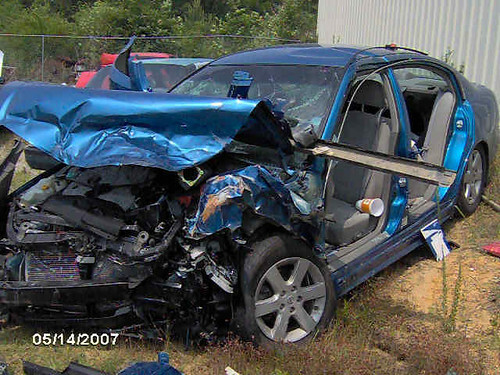 Similar crashes claim the lives of thousands a year. There have been many thanks offered to the Almighty over the course of this past week from the nascent Miller household.